This series is targeted to learners of all levels. Much of what we discuss is targeted specifically to our program and helicopter layout; however, the knowledge itself is still very generalizable. We hope you will enjoy the content and use it to help improve the care we give our patients during flight. This month we will start off with a core content area that is sure to cause some anxiety - the pediatric airway. This post was the product of a pediatric scene flight that was full of challenges. We were called out for an infant in status epilepticus that required airway intervention. Ultimately, the airway was maintained in flight with an iGel and the child did well. However, there were some harrowing moments in between. Below is a combination of what went well, as well as a few pearls on how to smoothly care for these sick patients. "18 mo female, seizing, difficulty breathing"
Of core Air Care knowledge and procedures, pediatric airway management is one of the most nuanced and harrowing concepts. How do you prepare? What can you do ahead of time to ensure that your cognitive load is minimized when the adrenaline is flowing? The rest of this post will focus on how to maximize your chance for success when faced with a pediatric intubation in the field. 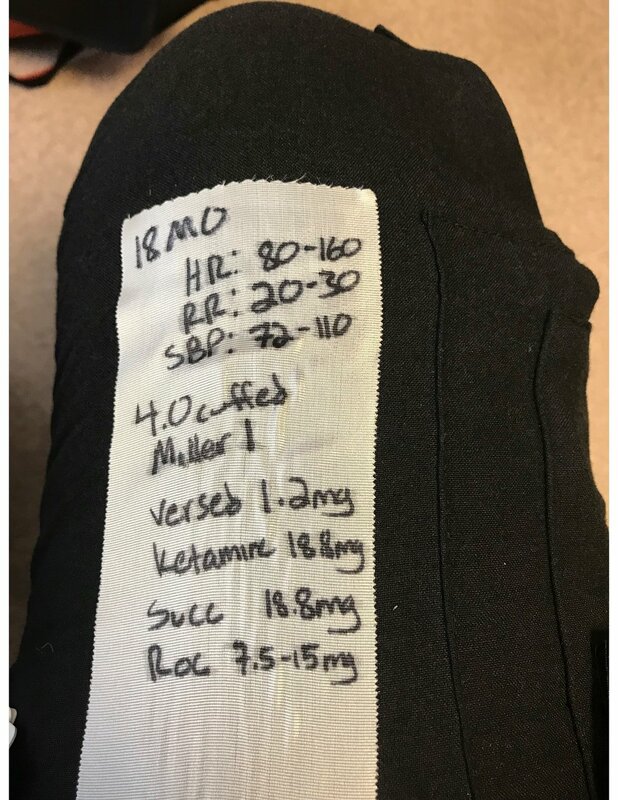 Medication Doses and Equipment sizes written in flight. Airway Equipment: determine items such as blade, tube size/depth; as well as backup airway equipment sizes. Airway Medications: determine dosing for desired induction and paralytic agents. Don't forget about post intubation analgosedation in the form of ketamine or midazolam/fentanyl. 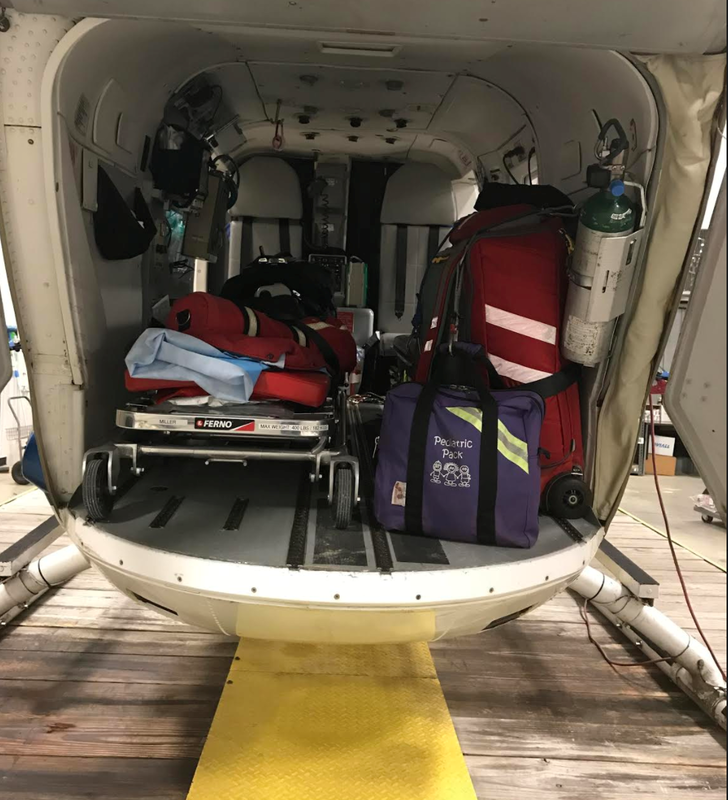 Seizure Medications: determine dosing for benzodiazepines (midazolam or lorazepam) and loading dose of Keppra (which we now carry on AirCare in the special medication cell of the critical care bag). Vital Signs: even if not explicitly written down, having a refresher on the general VS ranges of the patient your're about to encounter can be helpful. Some providers prefer formulas for remembering things such as SBP, while others offload entirely to the app. So, for our example patient you might end up with something like this image to the right. If you are fortunate, you have had enough time on the flight to write down airway equipment size, airway drug dosing, and seizure drug dosing. Remember, if flight conditions allow, it is always a good idea to discuss your game plan with your nurse. Tap into their knowledge as much as possible, it will be invaluable. Now your pilot is calling for sterile cockpit as you make your final approach. What next? Step 2: Where do I find that? This section describes where to find all the equipment needed for the pediatric airway. It is specific to the layout of the helicopter we use. However, make sure you know where are of these items are where you practice. You will need two major pieces of equipment. First is your trusty black bag, strapped to the cot and ready to go. This includes basic airway equipment and medications. For this flight, you will also need the Pedi Pack - this is the purple bag that will be the first thing you see when you open the clamshell doors (see image). The black back with pediatric airway equipment. Location of the Pedi Pack in the aircraft. Most of your airway equipment will come from the pediatric airway pocket in the back half of the black bag (see image above). This is where you will get your tube, stylet, blade, handle, as well as equipment to secure your tube after your success. Also, don't forget that the pediatric bougie is behind the adult airway bag with the adult bougie and the King Vision. The Pedi Pack may be a little less familiar. There is equipment for a wide array of adventures in this bag but there are two things that we should highlight. First, there are pediatric suction catheters in the black zipper pocket. These are soft suction catheters that take the place of the Yankauer at the end of a standard suction set-up. You may also find some of these in the aircraft in the container under the mount for the ventilator/triple-channel; but they are reliably in the purple bag. pediatric suction catheters in the pedi pack. The second major find in the purple bag is in the front zipper pocket: pediatric nasal airways! The packages in the bottom half of the picture hold clear plastic NPAs that look just like the adult airways you are used to seeing in the SRU. The green airways in the top of the picture have the added bonus of the adjustable flange that will prevent you from placing the NPA too deep. Inducing vomiting with an overzealous NPA is never good in the air! Now you have made it to the back of the squad/cornfield/rural ED with everything that you need. Your seizure patient has failed multiple attempts at benzodiazepines by EMS and is now hypoxic to 90%. Whats next? All but the sickest child that cannot be adequately bagged will benefit from the few moments of preparation up front that will lead to a smoother airway attempt. Remember, in all things Air Care, slow is smooth and smooth is fast. There are four categories to prepare to set yourself up for a successful intubation: access, medications, equipment, and positioning. Access: During your initial assessment you or your nurse should assess the access situation. If you are fortunate enough to have an IV or IO already placed, ensure that it flushes and there is no evidence of infiltration. If you or your nurse elect to place an IO, be sure to attempt to aspirate for bone marrow to ensure appropriate placement, at least rocking the IO to ensure stability. Medications: Select your induction and paralytic agents using the dose you already wrote down on your flight out to the patient. Laryngoscope Handle: Check your light and make sure the bottom is screwed on tight if the light is flickering on and off. Laryngoscope Blade: Your pre-arrival app check has given you an idea of what size to use. Remember that children will have a large floppy tongue and epiglottis. Strongly consider a Miller blade as your first line to move these structures out of the way. ET Tube and Stylet: Again, your app of choice has helped you with size selection. Strongly consider a cuffed tube as your first line as this will be easier to secure and is less likely to dislodge during multiple transfers and a bumpy flight. Don't forget your syringe to check your balloon. Twill Tape: Used to tie your tube down securely. Oral and Nasal Adjuncts: Ideally, the squad has already started to bag the patient, but improve the bagging efforts by placing a NPA, OPA, or both. Suction with Pediatric Adapter: This is the handy soft suction catheter that is located in the purple bag. This should be present for every pediatric airway. iGel: There is a card in the same pocket as the pediatric iGels that will guide you toward the correct size. This does not need to be pre-opened but should be present if needed. Eschmann Stylet, aka "Bougie": This should always be present as it can improve chance of success with a suboptimal view. Magill Forceps: These are in the pediatric airway section of the black bag. Have them handy if there is any concern that respiratory distress could be due to a foreign body. Positioning: Remember, the smaller the child, the larger his/her head is in proportion to the body. Assuming that you are not dealing with trauma and C-spine immobilization, a sheet/towel/blanket serving as a shoulder roll will go a long way. You should also ensure, as always, that you are in an ideal position relative to the patient. This could be on your knees in the back of the squad, lying on your belly in a field, or standing at the head of the bed if you are lucky enough to be in an ED. Step 4: Execute, Execute, Execute! Any Air Care airway will be different from an ED airway in several ways; one of the most important is the need to assign tasks. You will find that in the ED, things often happen with little or no reminding. However, in the field you will be working with providers who encounter airways with much less frequency and thus may require a few friendly reminders. While the nurse is drawing up and pushing drugs, delegate one EMT/medic to have suction handy and be prepared to hand you the tube. A second medic should be responsible for keeping time after paralytic is given, then monitoring oxygen saturation. One special consideration for a pediatric airway in the field is that you are likely to have a parent present while you are preparing for and attempting this airway. Keep this in mind as you enter the space, being mindful of your demeanor and tone. You may also consider assigning an EMT/medic to the parent to assist you with explaining procedures and providing support. Finally, if a parent is in any way compromising care, you have the right and responsibility to ask them to step out. Your medications are not having the expected effect: check your access! Pediatric veins are small and fragile and the margin of error when drilling an IO is small. Your paralytic may not be paralyzing because it infiltrated. You have a poor view: remember your positioning! Make sure you have a towel under the shoulders and that it has not slid up under the neck. Remember to use bimanual laryngoscopy (i.e., you manipulate the larynx to your liking and then ask someone to hold it in place). Finally, remember that the pediatric airway is anterior compared to the adult, thus, the Eschmann stylet/"bougie" is your friend! You lose a previously reassuring end tidal waveform postintubation: Put the blade back in! You are dealing with small tubes, and even smaller spaces. A movement as small as repositioning the child's head could dislodge the tube. Always be ready to visually re-confirm tube placement. Your flight nurse is a wealth of knowledge, never forget that you have this resource. 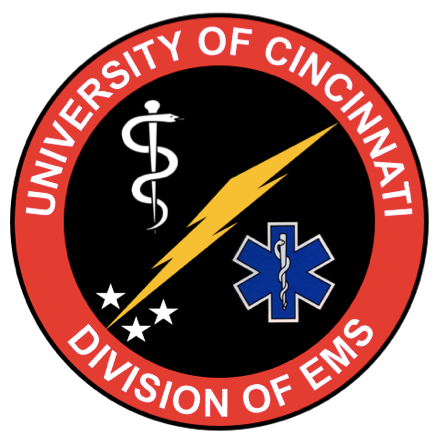 Furthermore, you always have an ED attending by phone or radio and, in the case of the pediatric airway, you can ask dispatch to call STATline if you would like to speak to a CCHMC attending.